You can capture and organize information about people by saving new contacts in your address book. Contacts are like electronic cards that save a person's contact information. A contact can be as basic as a name and email address, or include more information like a street address, multiple phone numbers, and a profile picture. You're in control of what information is added—and updated and removed—to a Contact card. Once you’ve saved someone as a contact, you can type the first few letters of their name into an email, and Outlook will fill in their email address for you. Or with a few clicks, you can call that person without ever having to look up their phone number. Open the message so that the person's name is shown in one of these lines: From:, To:, Cc:, or Bcc:. 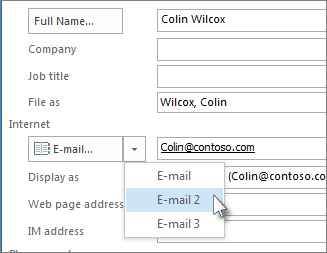 Right-click the appropriate name, choose Add to Outlook Contacts. In the window that opens, fill in the details you want to save. Note: Outlook inserts the contact's email address in the Email box, and any other information about the contact that's available in the message in the appropriate boxes. If a contact is in your organization, that probably includes their title, department, phone number, and office. Click People at the bottom of the screen. From the File menu, select New Contact or press Ctrl+N. Tip: To create a contact from another Outlook folder, press Ctrl+Shift+C. If you want to immediately create another contact, choose Save & New (this way, you don't have to start over for each contact). 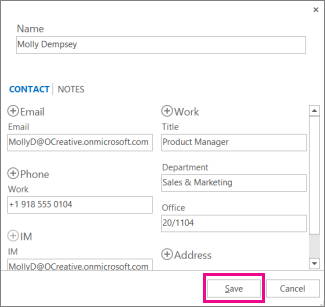 To add another contact from the same company, choosethedown arrow next to Save & New, and then choose Contact from the Same Company. When you're done entering new contacts,, choose Save & Close. You can save more than one phone number, email address, or mailing address for someone. If you haven't added the contact before, create a new contact. Otherwise, open an existing contact. Click the down arrow next to E-mail, any of the Phone number fields, or the Business address, and then select one of the other options from the drop-down box. For example, to add a second email, select E-mail 2. 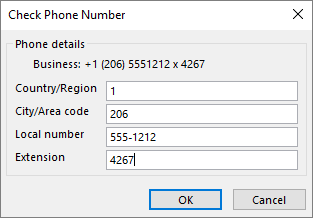 To add a TTY/TDD phone number, click the arrow next to any of the phone fields and select TTY/TDD. If you have a picture of the person saved on your computer (or in some other location), you can use it in their contact information. Click the image icon in the new contact box. Locate the picture you want to use in the Add Contact Picture box, and then click OK. Import contacts from a .csv or .pst file A .csv file contains contacts you've exported into a text file, where each part of the contact's information is separated by a comma (.csv means "comma separated value"). A .pst file is a file exported from Outlook into a format that another computer running Outlook can read. See Import contacts to Outlook for Windows to learn more. Get contacts from Excel You can use the Import and Export Wizard to bring in contact information saved in an Excel file, such as .xlsx or .xls. You're in control of what information is added to a contact card. You can update and delete information as you choose. On the File tab, choose Options > People . In the Default "Full Name" order list, choose an option. In the Default "File As" order list, choose an option. On the Home tab, in the Find group, choose Address Book. In the Address Book: Contacts dialog box, in the Address Book list, choose the address book where information for the contact is stored. Select the contact you want to change, right-click, and on the contact card, modify or update information as desired. Choose Save & Close > File > Close. On the Contact Card, under Phone numbers, choose Business. Note: Don't choose the drop-down arrow adjacent to a Business, Business Fax, or Mobile box. Choose the actual box. In the Check Phone Number dialog box, fill in the Phone details, including the Extension Number box. 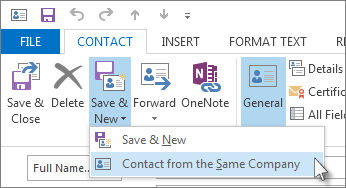 On the Contact tab, in the Actions group, in the Forward list, choose As an Outlook contact. Note: The Contact card will be forwarded as an attachment in an email message. On the File menu, point to New, and then click Contact. Keyboard shortcut To create a contact, press Ctrl+Shift+C. Type a name for the contact. Enter the information that you want to include for the contact. To specify how you want the contact's name to appear in the To line of a message, type a name in the Display As box. To enter multiple entries for a field, such as more than one phone number or e-mail address, click the down arrow next to the field. If you have more than one mailing address for a contact, select the This is the mailing address check box to establish which address is to be used during a mail merge. Tip: You can quickly create another contact with the same company information. In the current contact, on the Actions menu, click New Contact from Same Company. You can create a new contact from an existing contact by using the existing contact as a template, and then changing any of the information, as necessary. 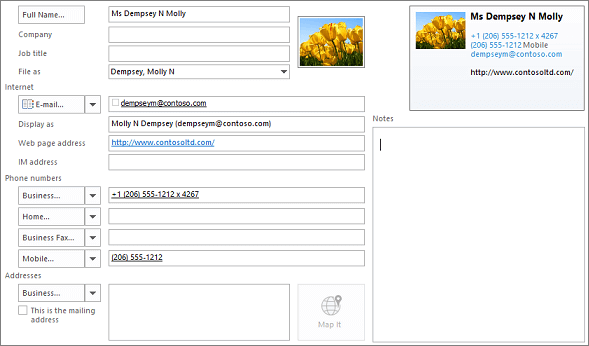 In Contacts, in Business Cards view, click the contact that you want to use as a template. Note: You can also complete this procedure in the Address Cards and Detailed Address Cards views. Press CTRL+C, and then press CTRL+V. In the Duplicate Contact Detected box, select the Add new contact option. When you save a contact or an Electronic Business Card with the same name or e-mail name as one that already exists in your Contacts folder, Microsoft Outlook displays a dialog box with options to either add the duplicate contact as a new contact or update the existing contact with the new information from the duplicate contact. To find out more, see Resolve or delete duplicate contacts. The new contact will appear in Business Cards view next to the contact you copied. Double-click the new contact to open it, and then edit the information, as needed. Open or preview the e-mail message that contains the name that you want to add to your contact list. Right-click the name of the sender who you want to make into a contact, and then click Add to Contacts on the shortcut menu. Note: In Outlook, there is no option to add contact information automatically to Contacts or Address Book when you reply to a contact. When you save an Electronic Business Card received in an e-mail message, you create a new contact. If you already have a contact by the same name, you can save the duplicate as a new contact or update the original. In an open message, right-click the card, and then click Add to Contacts on the shortcut menu. The new contact opens in the contact form. On the Contact tab, in the Save group, click Save & Close. Select Add the new contact. This creates a duplicate contact, including a contact form and Electronic Business Card. Select Update the information. Existing duplicate contacts are listed. Double-click the contact to update it, and then update the information on the contact form and save it. The new contact information is now saved in Contacts and is available as an Electronic Business Card as well as in other views. You can make changes to the contact information both before and after you save it. To make changes to the card after you save it, see the instructions in Create Electronic Business Cards. You can also right-click the attached .vcf file in the message header to open the shortcut menu and add the contact or choose other options. If you click the Save & New option in the contact form, the open contact is saved, and a new, blank contact form opens. This feature requires you to use a Microsoft Exchange Server 2000, Exchange Server 2003, or Exchange Server 2007 account. Most home and personal accounts do not use Microsoft Exchange. Open the public folder in which you want to create a contact. If the Folder List is not visible, click the Go menu, and then click Folder List. Click Public Folders, and then click the folder that you want to open. If the folder that you want to open is located within another folder, click the plus sign (+) next to each subfolder until you find the folder that you want. Type a name for the new contact. To enter multiple entries for a field, such as more than one type of phone number or address, click the down arrow next to the field. Click Save and Close . You can create a new contact only in a Contacts folder. For example, you cannot create a new contact in a mail folder.